One of my most favorite appetizer platters to serve at parties is an Herbs and Feta Cheese platter. It is always a hit with everyone and the first one that people eat to the very last leaf of herb or cheese crumble. I always love to see non-Persians’ reaction to the taste of this dish because at first there is a hint of skepticism because they have never seen anything like it before. But without fail, they are hooked at the first bite. So I always make sure that we have this platter at every single party! This combination of Persian herbs and feta cheese is simple, yet delicious. In some households this combination of herbs and cheese is included as part of the meal. A wonderful addition to the platter are either almonds or walnuts. I usually include both. You can serve the feta cheese uncut in a block, or cut it in cubes. I find it that it’s much easier to cut it up in cubes. 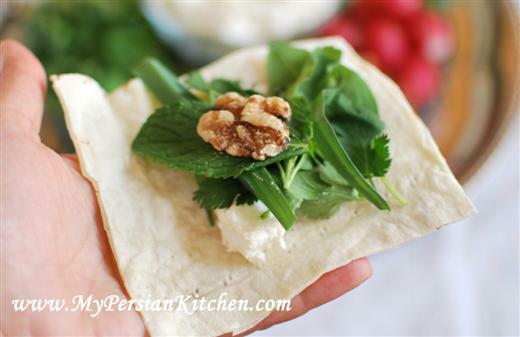 Always have some Lavash bread or any other type of Persian bread at hand in order to make a bundle filled with herbs, feta cheese and nuts. Close the bundle and take a bite! So good! The combination of the saltiness of the feta cheese, the walnuts or almonds, along the flavorful herbs is heavenly. 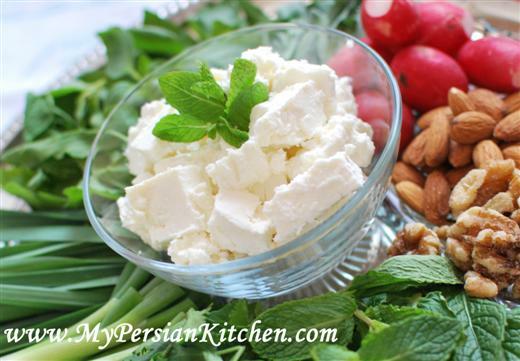 For a tutorial on how to clean Persian Herbs please click here. The best, it’s so appetizing. My mom always included this dish with meal every time we had quests over. I personally like to soak the walnut /almond in cold water and salt for few hours before serving it with feta cheese. Have fun in Hawaii . Hi Sanam – that would be a favorite here. We usually think of herbs as a garnish, but they ought to be the highlight. You need to stop by Gail’s house as she is growing a lot of fresh herbs here in San Pedro. 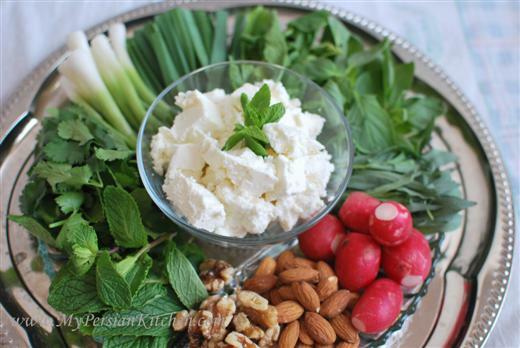 @ Lori Lynn, Persians have a deep love affair with herbs. I would love to check out Gail’s garden and see what she’s got growing! @ Maryam, I have recently been soaking my almonds and walnuts and love the way they taste. I had never thought of soaking them in salted water. I might have to try that!! My dad would always insist I have this as a snack when I’d come home after school and whine “I’m hungryyyyyyyy.” (Never mind that he has a phobia when it comes to cheese.) It was the last thing I ever wanted. Now, I find myself coming home after work and wishing I had some noon-panir-sabzi on hand to serve as fuel before I start making dinner. I’m not sure if the flavors involved are more “grown up” or if I tend to wax nostalgic. But just a faint whiff of reyhan makes me salivate now. One suggestion: leave the walnuts and almonds in salt water a few days before serving. They can be kept in the fridge much longer. They become as tasty as fresh nuts; The brown skin is rich in vitamin B9 (foldine) and fibre but can be removed for better taste. @ Omid, almonds and walnuts are the best snacks ever! I know exactly what you mean about nostalgia, because the smell and taste of it takes me right back to Iran! @ Farhan, thanks for the tip! Soaked nuts are definitely better, I do agree! As a non-Persian person, I can only say this is one of my favorite treats, in fact, I kid you not, I am munching on some now with a lavash to hold it all together. Although mine might not be too traditional as I threw in a bit of dill. I love this with carrot jam!This is fantastic for breakfast too. Sarah, I don’t usually have herbs for breakfast, just lavash, feta cheese and jam. Oh so good! My husband and I call this “lazy night dinner”…when we don’t want to cook or it is too hot to cook. This is such “comfort” food and takes maybe 10 minutes to prepare!! @ Heidi, I can’t thank you enough for your kind words or tell you how your comment touched my heart and made me happy! 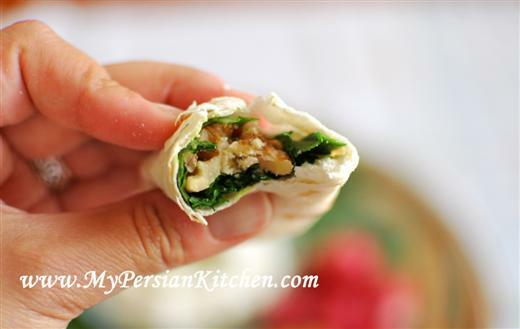 I am so happy to hear that my recipes are helping you with your Persian cooking adventures. It is when I read comments or emails like yours that I am reminded that all the work and effort that I put into MPK is well worth it! @ Shannon, one of the best comfort dinners, I totally agree! Thank you so much for sharing all these delicious recipes! My husband is Iranian-Canadian and I love Persian food so much. I have been learning from my mother-in-law, who is an amazing cook. But thanks to your website, I don’t have to call her for instructions every few minutes when I’m making a meal. Do you have any advice for good Persian food stores in NYC? I’ve been looking for a place to buy sangak, lavash and some other staples. Annie, thank you for your kind words. I am not familiar with NYC. You may want to look either on the internet or in white pages. I made this as the “greens” component of our dinner tonight and my sister hasn’t stopped talking about it yet This will definitely get repeat outings. In like the idea of having it as an after-work snack too, as some people have suggested. Actually, I like the idea of taking some to work too. Lunch envy, here we come! @ Kim, I have never had this polow with potatoes. Please have been talking about it on the fan page. This is something new for me!!! Katie, it’s truly a delicious combination and can be had at any time! I’ve only been introduced to Persian cooking in the last year when my brother married into a HUGE Persian family. Oh the food they served at the wedding celebrations and the dreams I’ve had of it since!! I even planted tarragon in my herb garden as a result of my instant love affair with this dish! (what a surprise that it’s sprung up again this spring, heartier than ever). I can’t wait to serve it at a dinner party in a couple weeks, but my small midwestern town isn’t known for it’s varied selection of Persian ingredients. Any suggestions on a substitute for the Lavash bread? Beth, you can use Pita bread. If you don’t have pita bread you can use french bread as well. just the idea is so great, without tasting it, i think i am hooked on this appetizer, which I am going to make it for my xmus party …thanks for sharing this unusual appetizer. Reeta, you can purchase all the ingredients for this recipe from Hawthorne International Market on the corner of Hawthorne and PCH!! I made this platter for a bridal shower yesterday. Though we are mostly Scottish and English, my cousin is marrying a girl of Persian descent and I wanted her family to feel welcome at the shower (I understand bridal showers aren’t a normal part of the Persian culture). I added pomegranates and watermelon, as well. AND I soaked the walnuts, as a commenter suggested. I got rave reviews on it form the Persians in attendance, so thank you VERY much for your guidance! Nicole, I am so happy to hear that you for rave reviews!! 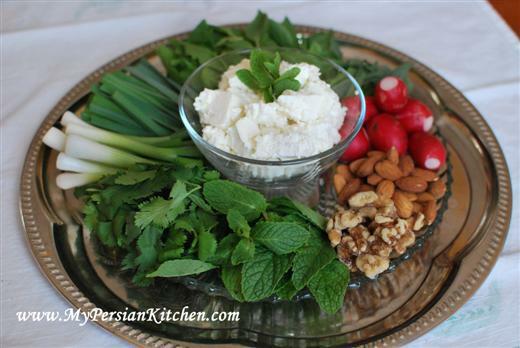 Can’t go wrong with this platter with Persians!